You may not have realised before how heavily the medical industry relies on plastic. (In fact, we’ve gone into a bit of detail before on the nature of the relationship between plastic and medicine – it’s worth a read!) Beyond plastic in general, though, rotomoulding has always been a particularly useful plastic manufacturing process for medical equipment. Here are just a few reasons why! Roto moulding has a whole range of applications across the medical industry. For starters, smaller rotomoulded products or parts can be ideal for practical surgical purposes or specialised roles – for example, facial oxygen masks. Alongside this, larger products are often brilliantly suited to the role of therapeutic aids and support equipment for patients. 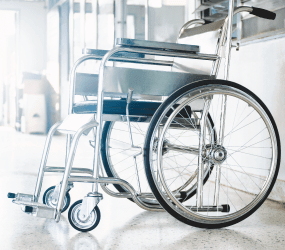 In fact, procurement professionals also often favour rotomoulding for its ability to fabricate mid-to-large scale products that are hardwearing and sturdy enough to take the full weight of an adult (like stretchers, canes and wheelchair bodies). For similar reasons, roto-moulding is uniquely suited to create other frequently-used hollow items like prosthetic limbs. Of course, amongst the core advantages of roto-moulding for the medical industry is that plastic products can be easily and cheaply moulded. Injection moulding often requires product runs of hundreds of items before their initial costs start to level out, while rotomoulding is excellent for short product batches, sometimes even as small as between 1 and 10 items. Since hospitals and GP’s offices can often find themselves strapped for finances, this means that roto-moulding is an excellent process for procuring equipment on a budget without any associated dip in quality. The quality and durability of roto moulded products helps medical facilities to get more out of their plastic products in the long run, therefore allowing them to divert the maximum amount of funds towards actively assisting patients. It’s these small product runs that means roto-moulding is also great for manufacturing non-essential items that might not be required in large numbers – for example, anatomically-accurate models to assist in the training of medical students and other personnel. No matter how much technological progress we see in our lifetimes, proper storage is one of the many aspects of the medical industry that will never become obsolete – and happily, it’s an area where roto-moulding particularly shines. We’ve touched upon a few details in our list above. Our own materials handling products embody many of the qualities that make plastic boxes and containers so useful to hospitals and clinics – they are highly durable, impervious to water and naturally resistant to germs and chemicals. The plastic casings can also be modified to effectively refrigerate their contents – another frequent requirement in the medical industry. Roto moulding is a fantastic way of testing new ideas and designs for medical products, as it’s particularly effective for producing small, experimental product runs (or even single products). By nature, the medical industry is one that’s always looking forward, thriving, innovating and experimenting to find new ways of overcoming illness, disease, disability and injury. For that reason alone, there will always be new prototypes that need to be made, and rotomoulding is an excellent plastic manufacturing process to fabricate them. Here at Excelsior, the medical industry is just one of many that we serve with our own roto-moulding processes. If you’ve got an idea for your own plastic product, just give us a call on 0161 765 2010 to find out how we can help you make it a reality!